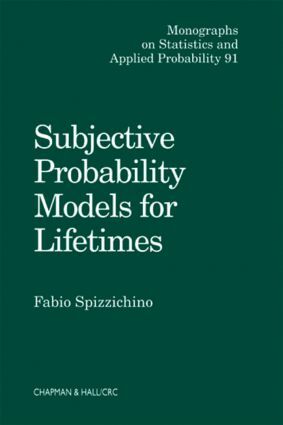 Subjective Probability Models for Lifetimes details those differences and clarifies aspects of subjective probability that have a direct influence on modeling and drawing inference from failure and survival data. In particular, within a framework of Bayesian theory, the author considers the effects of different levels of information in the analysis of the phenomena of positive and negative aging. The author coherently reviews and compares the various definitions and results concerning stochastic ordering, statistical dependence, reliability, and decision theory. He offers a detailed but accessible mathematical treatment of different aspects of probability distributions for exchangeable vectors of lifetimes that imparts a clear understanding of what the "probabilistic description of aging" really is, and why it is important to analyzing survival and failure data. "…there is also much clear and helpful explanation of concepts …particularly useful for research students." "The author's lucid presentation of his material together with this very great number of applications from life sciences, make this an excellent buy…"
"…even hard-bitten mathematical probabilists may find new insights in this insistently realistic approach."